This escape room is a scavenger hunt style activity that includes five interactive challenges related to executive functioning skills. Students work together to solve a variety of puzzles and challenges in order to discover the secret phrase to unlock the door and win the challenge in a specified amount of time. 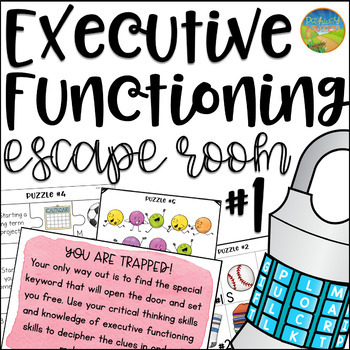 This executive functioning escape room activity is best suited for small groups, advisory periods, or resource rooms. A whole-class version is also included! An escape room activity is a challenge that allows kids to work together solving a variety of puzzles in order to "break out" of a room. After each puzzle is solved, they will get a clue that leads them to a new location. Each new location includes a keyword to win or "escape" the room and a new puzzle. Escape rooms are great to have kids and young adults working collaboratively using their critical thinking skills. 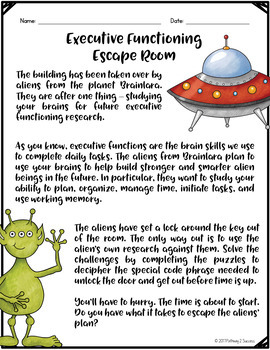 After setting up the room, you will introduce the escape room challenge to your students by explaining that aliens have taken over and have plans to take over our brains to study executive functioning. Students are instructed that they only way they can get out is to follow a series of challenges to uncover a special phrase to unlock and open the door. Best of all, they must use their knowledge of executive functioning strategies to do so! You may provide hints along the way or offer "Hint Cards" as a accommodation for kids who may need extra support with the challenges. How Much Prep is Required? You will need to print and cut the puzzles, using the visual guide to help you. Then, you will need to place them in envelopes or folders so that groups will work on only one challenge at a time. Note that some puzzles you can choose to just leave as is without cutting to reduce your prep! Directions with visual directions are included to make the setup as easy as possible! To set up, you will print and put together each puzzle set in an envelope. Then, you will hide each envelope in its designated location. Locations include: near a shelf, the board, near a tissue box, by the phone, and more. It is recommended to hide the envelopes so that students have to search in the designated location to find. 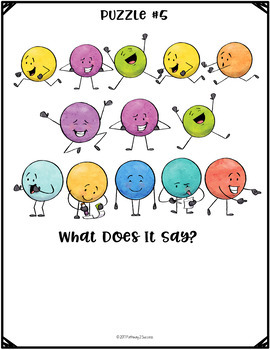 For the whole-class version, you will create sets of envelopes for each group with the clues and materials inside. Each group will work on the challenges together. When a challenge is finished and they know the "password", they will raise their hand to tell you privately. If they have the correct password, they will advance to another challenge and you will give them that envelope! Best of all, each group can be working on difference challenges, as you do not have to go in order. Note that a separate version is included for you to write in your own key phrase. This is important if you are running multiple groups throughout the day and don't want any students to "spoil" the keyword for the challenge. 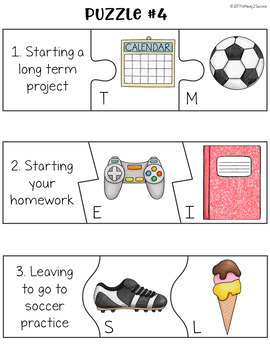 The executive functioning skills targeted within this resource include planning, organization, time management, task initiation, and working memory. Each of the challenges actually discusses and forces students to utilize these in order to solve each puzzle! Both color and black/white versions are included! Save 20% with a Bundle! A set of interactive scavenger hunt style escape rooms focused on executive functioning skills, conflict resolution skills, growth mindset, and coping strategies. Both small group and classroom sets are included. Need MORE Executive Functioning Ideas? Target executive functioning and study skills necessary for academic success at the middle and high school level. The bundle includes over 400 pages full of lessons, templates, and workbook pages to teach study strategies and ways to improve executive functioning skills. It includes a HUGE selection of my executive functioning and study skills materials in one place.